In the pleasant terraces of the Golden Triangle off of the Earlham Road is this tiny little brick built chapel, its elegant frontage sandwiched between the houses. It was built in Park Lane to the design of Augustus Scott, whose other non-conformist buildings in Norwich include Dereham Road Baptist Church, although that is a far grander proposition than this little jewel. It was built at the expense of James Spilling, Ipswich-born editor of the Eastern Daily Press, who lived at 30 Park Lane and was a follower of the teachings of Emmanuel Swedenborg, the 18th Century Swedish theological philosopher. Swedenborgianism was an intellectual approach to preparing for the second coming of Christ. Swedenborg said that he had been shown a millennial vision, during which it was explained how Christians were to prepare for the end of the world. His writings are extensive, but his followers believed in essence that they would be judged by the good they did for mankind as a whole during these last days. Although Swedenborg himself never organised a congregation, he spoke of a New Church for those who followed his teaching, and within a few years of his death his followers began to form this in reality, particularly in America. By 1832, there were enough Swedenborgians in Norwich for them to take over the lease of St Mary the Less from the French Protestant community. They moved on to a meeting hall off of Elm Hill in 1869, passing on the lease of St Mary the Less to the extraordinary Catholic Apostolic Church, and then in 1890 they came here. The church is typical of its decade, stone-traceried windows in the Transitional style punctuating the red brick walls and an apse at the end furthest from the road. 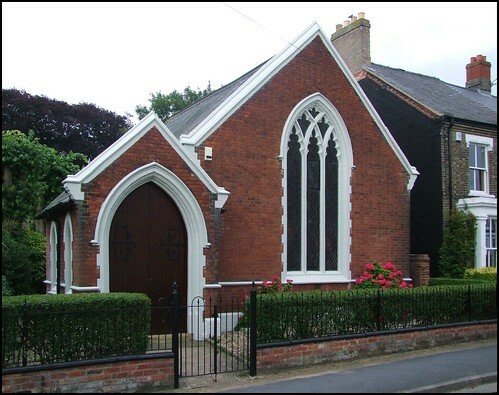 By the time this chapel was built, Swedenborgianism was already in rapid decline, and within twenty years the last of the Norwich congregation had sold the chapel to the Mormon Church of the Latter Day Saints. The Mormons moved out to their purpose-built centre at Eaton in the 1960s, and a congregationalist sect called the Haymarket Meeting took this chapel on, before selling it as a private house in the 1990s. In fact, it is not used for residential purposes, the philanthropic owner allowing its use for meetings, concerts and functions. Internally it is decorated in a sympathetic style, the yellow walls picking out the elegant woodwork. It is a delightful place, and a pleasing survival.